Donna's Designs: A Brand New Year! 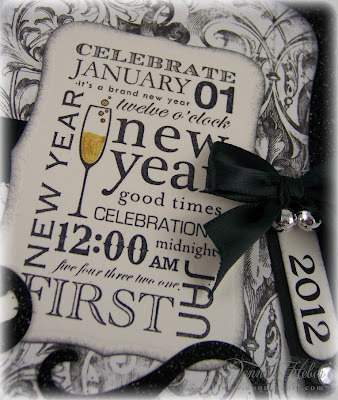 Before the ball drops and we ring in the New Year, I'm sure many of you have made New Year's resolutions for 2012. Whether it be to get in shape, eat healthier, save more money, or start a new hobby (like blogging) I wish each and every one of you the best in 2012. I know the most difficult part of keeping a resolution is sustaining the momentum after the first couple of weeks. Personally, I have decided not to make any resolutions for the coming year and to just enjoy each and every day. Thanks again for a great year of blogging. I have met some wonderful friends along the way. Wishing you a happy and healthy New Year! Here is the card I created to celebrate 2012. Happy New Year, Donna! 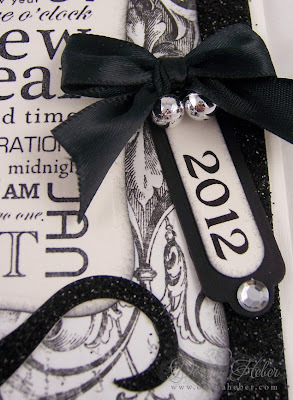 This is the perfect card to ring in 2012 ... I LOVE it! Happy New Year, Donna! The card is absolutely gorgeous. I love the luxurious look of that ribbon. What a great card to kick off the new year! I love that stamp and the whole card is just beautiful. I wish you and yours a wonderful new year, full of luck, love and inspirations. 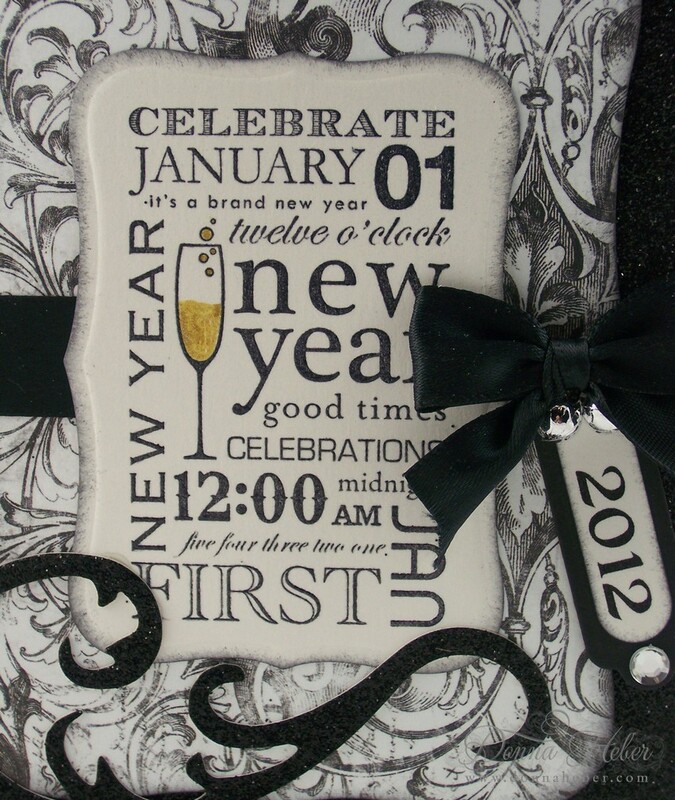 Gorgeous card Donna..Happy new year. Your card is absolutely gorgeous! And, I'm with you on not making resolutions this year. Happy New Year! best wishes for 2012 donna may it be a creatieve year. this card is very elegant, just beautiful. 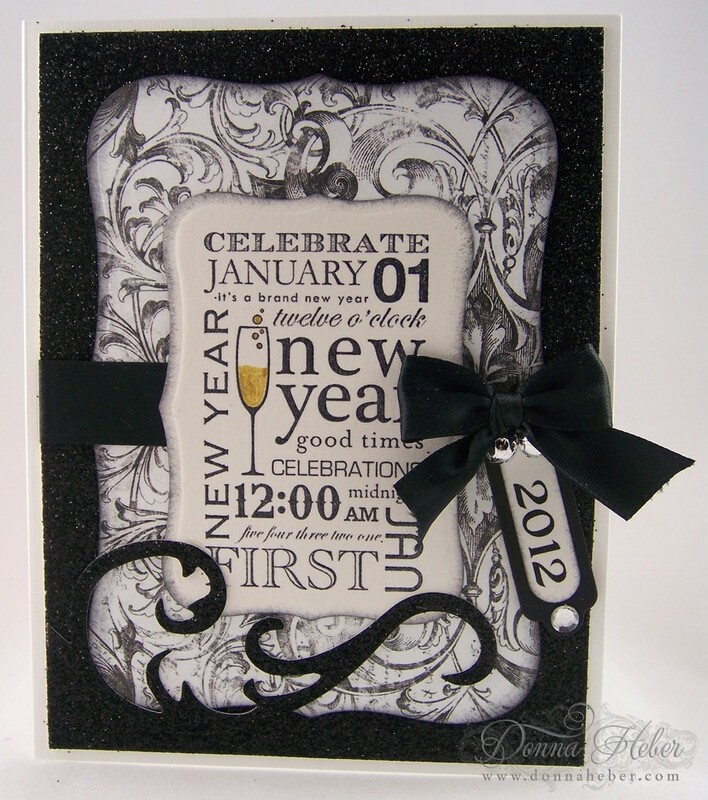 I really like the black and white color scheme with just a hint of color. Another beautiful card! !